Consider Oaxaca Digital Photography Expedition: Market Towns and Artisan Villages, June 29-July 5, 2011. It’s not likely we will have a film making workshop in 2011. For seven days, from Friday evening, February 19, to Friday, morning, February 26, you will immerse yourself in the art and craft of documentary film making in the indigenous Zapotec village of Teotitlan del Valle, Oaxaca, Mexico. There are 7,000 people and 2,000 looms in this famous rug weaving center situated 15 miles outside the colonial capital of Oaxaca City. This learning laboratory opens your eyes to new perspectives. A core aspect of this workshop is to encourage you to take the skills and insights you gain through this cross-cultural experience back home to document your own community, culture, or advocacy project with fresh vision. Creating a documentary is much more than learning how to point, shoot and edit. Capturing the unique voices of your subjects is at the heart of the work. Topics may include the intimate rituals of daily life — making tortillas from scratch, preparing natural dyes, the voices of women, celebrations and life cycle events. Newsflash: Artist Panteleon Ruiz, a renowned Zapotec painter who incorporates natural dyes in his oil pigments, will be one of the subjects for the film workshop! You will work in small groups, guided by expert faculty who give you the creative freedom to produce a 3-5 minute short subject film. A celebratory final night viewing will showcase everyone’s work. This is an excellent opportunity for those who want to get a first hand experience in documentary field work — all in a great travel destination. or other global sites.It is also a great way to develop a professional skill. Professional development expenses can be tax deductible (travel and workshop tuition). After you register, faculty will contact you to discuss your interests and skill level. Then, we’ll send you a complete packet of materials, including a list of what to bring, like your own camera and tapes. Pre-workshop readings will address: What style of documentary do I want to make? What issues do I need to be sensitive to when entering an unfamiliar culture? What about using my video camera, microphone and lighting? How do we maximize the collaborative process with teammates and crew? What are film production stages? Can I really learn to edit? How do I conduct an effective interview? When you arrive in Teotitlan, you’ll meet the faculty and we’ll give you your documentary topic. We will pre-arrange your field contacts and provide bilingual translators to accompany you on interviews. You will then work with your partner and faculty to develop the technical and creative approach that best fits your personal and professional goals for the week. · The experience of a lifetime! Accommodations are in a lovely village guesthouse with bougainville and pomegranate trees. The setting is traditional, yet comfortable. The Zapotec proprietors are a daughter-in-law and mother-in-law team — gracious hosts and excellent cooks. As guests in their family compound, you will taste delicious traditional foods that Oaxaca is famous for and live with the family during your stay. An intimate and rewarding experience! Erica Rothman, LCSW, is a documentary filmmaker who uses her psychotherapy background to understand and capture her subjects with sensitivity and depth, in an intimate and compelling way. As the principal of Nightlight Productions, she has written, produced and directed acclaimed projects, including full-length documentary films, that focus on local and global health care, public policy, the arts and humanities. She received a 2007 Gracie Award for American Women in Radio and Television, and key awards at the Houston International Film Festival. Rothman teaches in the Duke University Center for Documentary Studies. Jim Haverkamp is a filmmaker and freelance editor based in Durham, North Carolina. His short fiction and documentary films have shown at over 50 festivals around the world, including Chicago Underground, the Ann Arbor Film Festival, and the Maryland Film Festival. He has taught filmmaking at The University of North Carolina at Chapel Hill and Duke University, and was awarded a filmmaking fellowship by the North Carolina Arts Council in 2000. He teaches at the intensive documentary institute at Duke Center for Documentary Studies for six year. He hold the B.A. American Studies, University of Iowa. Cost and Registration: $1795 per person, double occupancy, including food and lodging outlined above. A $500 deposit will hold your reservation. Workshop limited to 6 people. Contact: Norma Hawthorne, (919) 274-6194 or normahawthorne@mac.com to register. Deposit: A $500 deposit will reserve your space in the filmmaking workshop. *Up to 30 days before the workshop start date, less a $100 cancellation fee. *After that, deposits are not refundable. If cancellation is necessary, you may apply the deposit to a future workshop. We reserve the right to cancel or reschedule workshops, in which case you may choose a 100% refund or apply the tuition to a future workshop. Documentation: U.S. citizens traveling to Mexico are required to carry a current passport, valid for at least 3 months after your re-entry to the U.S. It is your responsibility to carry proper documentation. If you are not a U.S. citizen, contact the Mexican embassy, consulate or a national airline of Mexico for entry requirements. Trip insurance: PLEASE consider purchasing travel insurance. Unforeseen circumstances of getting to Teotitlan del Valle could cost you more than you expected. In the event of an emergency or natural disaster caused beyond our control, trip insurance will cover any unexpected expenses. Transportation to Mexico, Oaxaca and Teotitlan; gratuities and fees; local bus and taxi fees, trip insurance, medical expenses, hospitalization, any other fees; evening dinner in Oaxaca, liquor; optional side trips and excursions; extensions to your stay. Schedule Upon registration, we will send you an outline of the week’s activities. Friday: Arrive in Oaxaca and take a taxi to your B&B in Teotitlan del Valle. We’ll provide you with directions and how to get from the airport to the village. We will meet together in the courtyard at 8:00 p.m. for a welcome reception. Saturday: Meet for breakfast at 8:30 a.m. Workshop starts at 9:00 a.m. and continues through the day into the evening. Sunday-Friday: Each day is planned with different activities to enhance the learning process. The workshop day typically begins at 9 a.m. after breakfast and continues, with meal and snack breaks, through the evening. We will take one late afternoon and evening “off” to go into Oaxaca City for comida together and to explore the sights. Saturday morning: Breakfast, summary and evaluation. 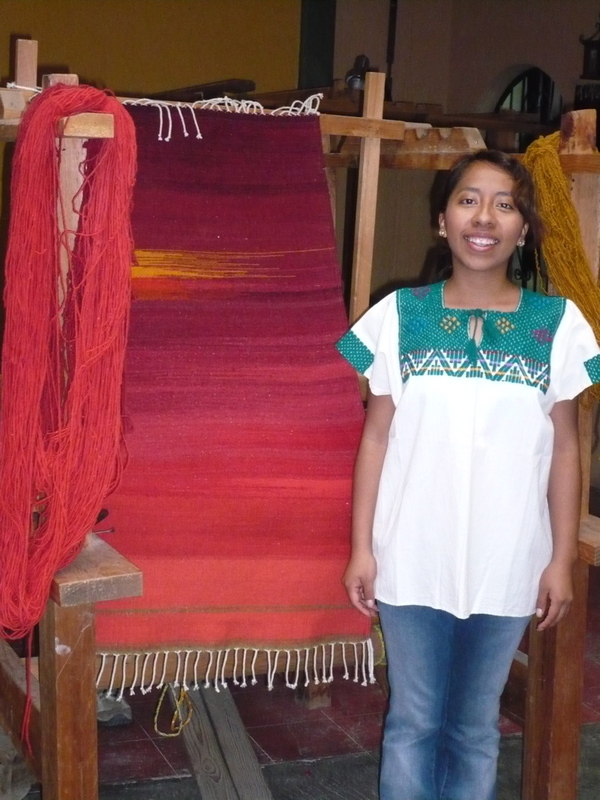 The workshop ends by 10:00 a.m.
We also offer weaving and natural dyeing workshops in Teotitlan del Valle! Pittsboro, NC – Textile artists, brother and sister Eric and Janet Chavez Santiago, from the village of Teotitlan del Valle, Oaxaca, Mexico, will present weaving and natural dyeing lectures, demonstrations, exhibitions and workshops in Siler City and Pittsboro during a 3-week artists residency starting Oct. 1, 2008. Over nine programs are scheduled, made possible through the North Carolina Arts Incubator (NCAI), located in historic Siler City. NCAI received a generous Grassroots Grant from Chatham Arts, through the NC Arts Council, to mount the extensive program. Most events are free and open to the public. Eric Chavez Santiago is coordinator of educational services at the Museo Textil de Oaxaca, the only museum in Mexico focused exclusively on textiles and their preservation. Janet is a university senior studying languages and linguistics. Both are fluent in English. The pair will discuss Oaxaca and indigenous Zapotec art, culture, archeology and history, and demonstrate 500-year old tapestry weaving traditions of their village. A natural dyeing workshop will focus on the preparation of indigo, cochineal and moss to dye wool and cotton for weaving, knitting, and other fiber arts. As the first artists-in-residence at the NCAI, they will have open studio space in which to work and talk personally with people. Please call ahead to see if they are there! A tuition-free, in-service training and education program for Chatham County teachers, provided by the grant, will offer creative arts techniques for teaching multicultural understanding. The Chatham Artists Guild is underwriting a public presentation to be held at Central Carolina Community College, Pittsboro Campus. Other activities will be held at Against His Will Studio, Siler City, and Chatham Arts Gallery in Pittsboro. A raffle to raise funds not covered by the Grassroots Grant, including travel expenses for Janet Chavez Santiago, is being sponsored by NCAI. Janet has donated a fine tapestry hand-woven rug that is naturally dyed. The prominent colors are shades of red using cochineal, with accents of indigo and moss. The rug is valued at $400. Raffle tickets are $10 each and only 100 tickets will be sold. Photo, upper right: Janet with her rug for raffle. 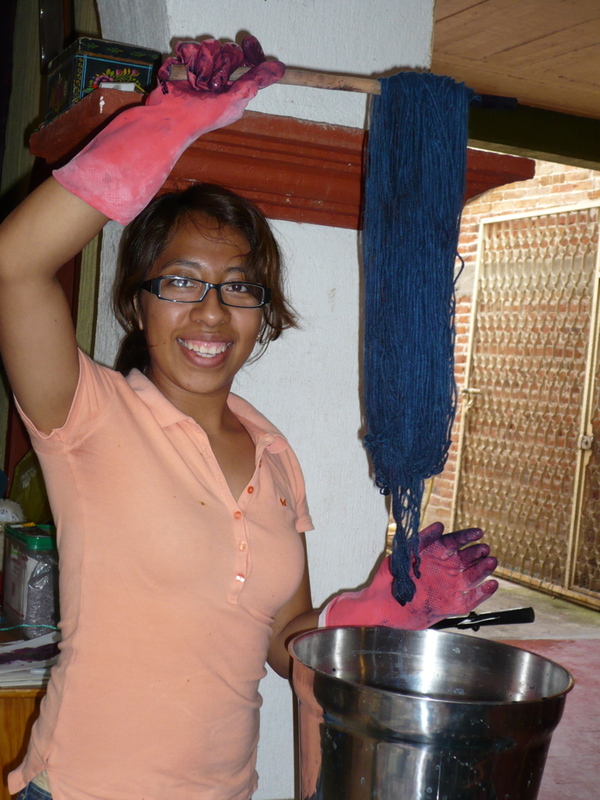 Photo below is Janet demonstrating techniques for dyeing with indigo at a recent workshop in Teotitlan del Valle, Oaxaca. After leaving North Carolina on October 24, the Chavez weavers will travel to South Bend, Ind., where they are invited by the University of Notre Dame Snite Museum of Art to exhibit at the annual Day of the Dead Celebration. The pair will also lecture, demonstrate and exhibit at the South Bend Museum of Art before returning to Mexico on November 3. The Chavez Santiago family programs are presented by a Chatham Arts Grassroots Grant through the NC Arts Council, North Carolina Arts Incubator, Against His Will Gallery & Studio, Norma Hawthorne Oaxaca Cultural Navigator, Chatham Artists Guild, and Central Carolina Community College, Pittsboro Campus, with special thanks to Hickory Mountain Weavers and Travis Cohn. For media: To arrange for a feature story or to cover an event, please contact Norma Hawthorne, (919) 274-6194. For organizations: If you would like to invite Eric and Janet to make a presentation to your group or guild, please contact Norma Hawthorne. Limited evening and daytime dates are available.